I pulled my taps yesterday morning and to my surprise no ticks. I'll be bringing up my woods tank and releaser next weekend and when I do that it's not uncommon to find some ticks. All it takes is one and I'm checking every little tickle to see if it's a tick. Not fun! I guess I'm just a tick magnet. I guess I forgot to finish my tick ramblings. Yes, permethrin is awesome. After the infamous weekend of 82 ticks on me I purchased some permethrin. Sprayed it pants and shirt. I did not have a single tick on me until the afternoon. It was crawling across the back of my hand. So I picked it off my hand and placed it on the cuff of my shirt where I knew the permethrin had been applied. It was quite a show. When ever I see a tick it is always compressed right to what ever it is crawling on with all of its legs spread way out. When placed on the permethrin treated clothes, it couldn't keep itself far enough away. It actually was stand on just 2 legs pushing its body as far away from the permethrin as possible. Then it would switch those first 2 legs for 2 others then for 2 others. Probably danced like that for a total of 1 to maybe 2 seconds. It acted like its feet were on fire. It would have been comical actually, except it was a tick. I have been doing this for the last couple years, we went from finding 100&rsquo;s of ticks a year to only 1 dead one in the house. I also built a deer feeder that has paint rollers impregnated with permethrin. 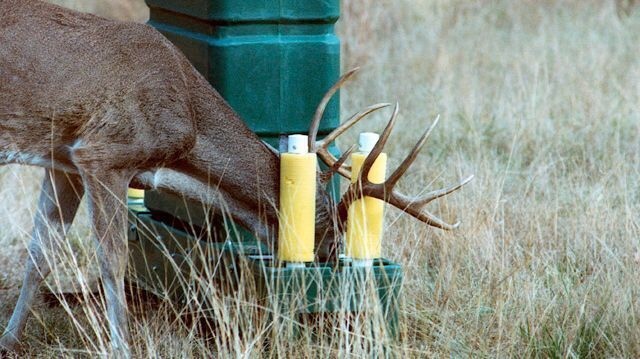 Deer and bear come eat corn and rub against the paint rollers for a tick treatment.